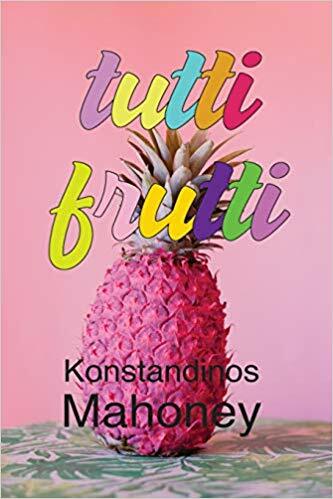 There is something beautifully life-affirming about Konstandinos Mahoney’s first collection, Tutti Frutti. It is not in any way a facile positivism, a kind of Pollyannaism, it is positive despite confronting us with the complexities and difficulties of a life fully lived. Like many first collections, Tutti Frutti is, at its core, an autobiographical journey through significant moments in the poet’s life. Through this immersion in the singular we begin to recognise many universal themes around family life, desire, and a sense of belonging or not. It is a life rich in variety in terms of culture, place and sexuality. There is no simple identity but a palimpsest of co-existing national, cultural and loving relationships. The poems dance with these themes and build up to a composite and multi-layered identity, replete with wit, that provides a welcome counterpoint to the simplistic sloganeering of today’s politicians. Mahoney’s mother was Greek and his father was Irish/English; Mahoney lived for many years in Hong Kong and his civil partner is Chinese. We sense the convergence of these cosmopolitan roots and experiences in these intensely rendered visions of life. The collection kicks off with a sequence of vivid snapshots from childhood. Mahoney’s larger than life mother comes across as a dominating presence. In the poem ‘Tutti Frutti’ the young Konstandinos comes home to discover his mother having an afternoon tryst with a female colleague from work. In ‘Riri’ she observes her son showing a more than sporting interest in the male tennis players in the park and in ‘Geometry’ Mahoney remembers feelings of nascent desire for a fellow schoolboy. The blackboard is abstracted with equations. On the desk – protractors, dividers. We build a fire; twigs and branches spit and cackle. He shimmers behind a veil of heat. smelling of smoke and desire. by glossy black horses with purple plumes – I spared no expense. food parcels, home baked cakes heavy as guilt. We sense the hard to resolve conflict between familial and societal expectations and the hopes and desires of the individual. Mahoney doesn’t flinch from conveying the conflicts and pain that result from grappling with a shifting identity. Despite having feelings for other men Mahoney married and had a child but subsequently came out as gay. 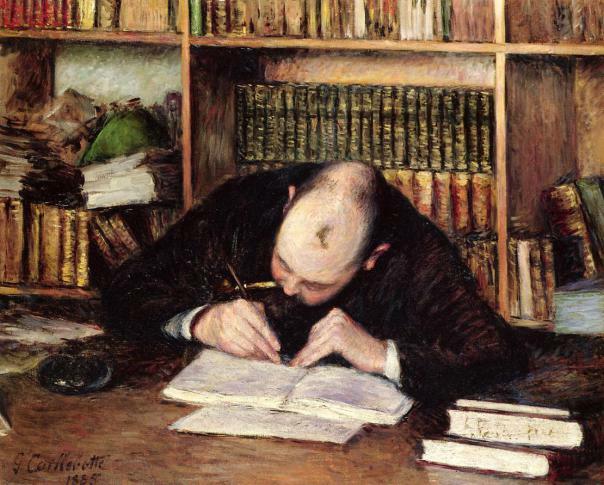 Some of the most moving poems in the collection (‘Handover’ and ‘Hotel Claire de Lune’) are those documenting snatched moments with his young daughter before having to return her to his estranged wife who is, one infers, incandescently angry at being betrayed by her husband’s sexuality. a loud legal clock ticking through its grinning teeth. they stare at each other with saucer eyes. that slams shut on her tiny baffled face. Even in our relatively liberal society the pressure to conform to long-established norms is still a powerful, albeit mostly unspoken, force. In ‘Pride’ a poem about attending the gay pride march in London, after the march is over and he and his partner merge back into the crowds around Oxford Street the poet notices: ‘… we’re no longer holding hands. a personal butcher for every man. with its bohemian charm, stole your heart. this is the moment, you are the one. It is not surprising that a cosmopolitan poet, who celebrates the power and beauty of hybridity, should have written the powerful anti-Brexit poem ‘Dr Mirabilis and the Brass Wall That Will Save England’ which won the Poetry Society Stanza prize in 2018. He unleashes a joyous skill in satire, in a mock heroic style, as he depicts the principal players in the Brexit cause as characters in an Elizabethan farce, who hire an alchemist (Mirabilis) to protect England by magically constructing a brass wall around it. ‘Go fetch,’ she charges, crossing leathered legs. transforming foaming pottles into piss. from Dover to the market-place of Rye. and brings it down hard upon The Head – the wall is dead. Alas, at time of writing, we are still waiting for that leg of lamb to save the day, while the daily news constantly swings between farce and tragedy. As I hope I have shown, this collection has a great variety, held together by the author’s personal story and a strong sense of human empathy. Mahoney’s warm-hearted, thoughtful and timely poems invite us to live a life without constructing barriers around ourselves, without fearing the other and giving way to ignorance and prejudice. When and how do we decide who we are? And is it something that we can, in any meaningful way, ‘decide’ on at all? It seems to me that these difficult questions are at the heart of Kate B Hall’s fascinating collection of poems. 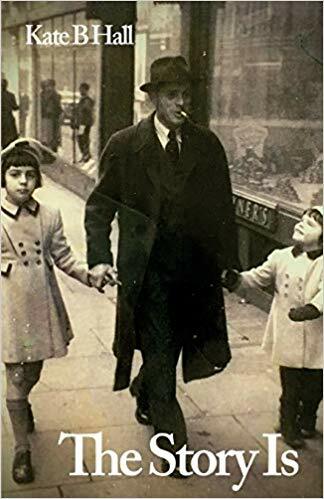 The cover of The Story Is shows a photograph of the author as a little girl looking up (being consciously engaging) at her father as she walks down the street with him and her older sister. Many of the poems in the collection have that veristic snapshot quality of the cover image, able in a flash to reveal a great deal about the subject, in a very economical way. This was our war even though we couldn’t remember it. In 1949 we still had gas masks and gas mask drill at nursery. and the box back that I understood the war was over. Not the right era for cultural celebration. What did you have for your dinner? This poem wittily and perceptively expresses how socially enforced norms put pressure on people to ‘pass’ as something they are not and keep their true identity undercover. All of us have experienced the uncomfortable sensation of not fitting in and Hall provides us with a cathartic expression of these anxieties. In ‘Tribute’ she highlights how it is often the most maligned people who are actually the kindest and most fun: ‘my aunt was a tart / I remember her / she was beautiful’. out of a Victorian melodrama. of the even newer National Health Service. nothing so clear as a full stop, though that may come later. neither of us understands these entries. I was in big trouble but my artwork remains. think often of stealing it. floating up into the clouds. and tie them round my wrist.